Another Good Beer Week has come and gone; and what a ride it was in 2017! This was billed as the biggest and best Good Beer Week ever and, in my mind at least, it certainly delivered on that promise! Kerry and the rest of the team deserve massive congratulations on the fabulous week they managed to put on. I'm reasonably sure that most of the events I attended are covered over the course of this Untappd Catchup, with maybe the odd exception of a Pint of Origin venue or two. Hopefully this post will not only shed some light on some of the fantastic beers I got to try during the week long celebration of good beer! After skipping the Opening Night Party to finalize an assignment so I could enjoy the rest of Good Beer Week, my first badge arrived during Saturday lunch. 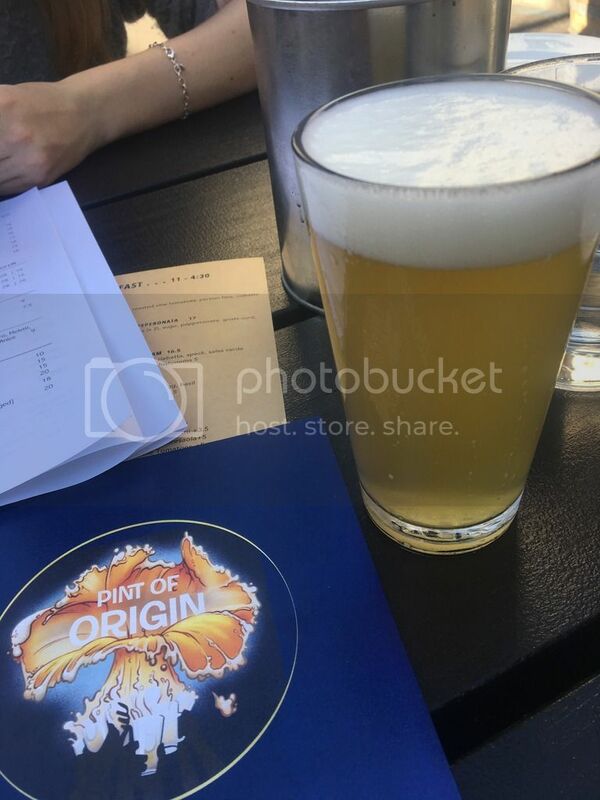 Fields of Gold (Level 10) was unlocked by Naparbier's Oneka, a Belgian Pale Ale, at Ladro Tap - a pizza restaurant in Prahran with an impressive tap selection that was the Southern Europe Pint of Origin venue. The beer was pretty inoffensive and easy drinking, with a touch of Belgian yeast the only real distinguishing feature. Paint the Town Red (Level 15) was unlocked at our next stop on what turned into an impromptu pub crawl; The Windsor Alehouse, in it's capacity as the Regional NSW Pint of Origin venue. The Hoppy Amber from 5 Barrel in Wollongong was the beer and I thought it was pretty impressive. It was packed with loads of caramel malts and almost as many hops, which provide plenty of bitterness. I'd be keen to re-visit this in a bottle down the track. The Riding Steady will be dead any day now. Four different beers unlocked this badge throughout Good Beer Week. The Pinkening was impressive pink and packed with Hibiscus. Omnipollo's Onda was packed with fresh tropical fruits. The Rauchbier from Clifton Hill was a lightly smokey offering, whilst Lervig's Lucky Jack was a crisp Pale Ale with nice citrus characteristics. Another beer at The Palace Hotel (South Australia's Pint of Origin venue) unlocked To the Port (Level 2). Robe Town's Solstice Baltic Porter was the beer, my first from them, and I had to say I was very impressed. The beer was perfectly to style, with heaps of sweet malts and was dangerously drinkable, belying its 8% ABV. As the weather keeps getting colder here in Melbourne, you'll be seeing plenty more of this badge. The Grosvenor Hotel, the Queensland Pint of Origin venue, missed out on a badge - but my home bar didn't! We called the afternoon just before dinner and I thought one more would be prudent. That beer was Blackwolf Brewery's William Wallace, which unlocked Wee Bit of Scotch (Level 2). This was a traditional Scottish Ale with plenty of sweet raisin flavours. It went down pretty easily, considering I'd had quite a few I think that says a lot about it! Beer Foodie (Level 2) was unlocked by a Feral Watermelon Warhead at The Royston at the start of a very long session with Coll & Dylan on the first Sunday of Good Beer Week. It was the perfect beer to kick off the session, with its usual spritzy, tart, watermelon flavour unique and pretty close to perfect! That said, the best beer I tried at The Royston was Feral's Biggie Juice - the best Australian take on a New England IPA that I've tried so far. Two different venues unlocked 3 levels of the Verified Adventure badge throughout Good Beer Week. My first visit to Exit Brewing's Uitgang Bar was straight after the Royston and the Fresh Hop Californicator was tasting even better than the origial - no mean feat. Omnipollo's Selassie followed at Beermash, dangerously early in the day for an Imperial Stout... Before Amager's Kåååd, at Beermash later in the week, was impressive as most Amager beers are. Beermash was also the venue for the first Better Together badge of Good Beer Week. Sky Mountain Sour is a collaboration between To Øl & Buxton and combined lovely malt with mellow tartness - I really want to pickup a bottle of this and try it again soon. Another Scandinavian/British collaboration saw Lervig team up with Magic Rock to produce their Farmhouse IPA. This beer was packed with Brett, so much so that any hops that may have been in there were swamped. Accordingly I can't tell you if it's an IPA, however it is very tasty! After quite a session at Beermash (I feel this is where most of my money went...) we walked around the corner to check out one of Melbourne's newest breweries; The Mill. The first beer that I tried on my tasting paddle was their Golden Ale, which unlocked Find the Source (Level 7). I'm generally not one for Golden Ales but this one was very nice, with a liberal hopping regiment helping it stand out from the crowd. The Dark Side (Level 2) was unlocked by Clifton Hill Brewpub's Dark Ale at our next stop; the aforementioned Brewpub. My recollections of specific flavours are not as sharp as they may have been at another time, however from past experiences and my Untappd notes I recall this being a nice Dark Ale with plenty of roast and a bit of caramel sweetness. Going back through it now, there were far too many beers after that point in time... Considering that, I felt really fresh the next day - maybe I was still drunk... Anyway, the next night at Stomping Ground, their Barrel Aged Saison unlocked Trip to the Farm (Level 23). The beer was spectacular, plenty of Brett with light Pinot Noir notes. The event was equally good, an Evening with Daniel Burns of Luksus fame. The food was excellent! After a relatively disappointing tap list at The Rainbow, Coll and I ended up at Beermash again on Tuesday night. This time a Buxton & Omnipollo collaboration unlocked God Save the Queen (Level 41). It was another from the ice cream series, the Lemon Meringue Pie. This is one I'm looking forward to revisiting in bottle form. It had a really nice tart lemon flavour and a light creaminess. Danish Delight arrived later in the week than I expected it would. Two Amager beers, both of which have already or will be talked about elsewhere in this post, unlocked the badge. The first was their Kåååd, an impressive IPA with lovely malt balance which was enjoyed at Beermash. Whilst the second was Brown Boobies Falling - an Imperial Porter that will be talked about in greater detail below. My first beer at home for the week arrived late Tuesday night. My parents got home from the Bahamas with some local craft beer. Pirate Republic is the number one craft brewery in the country and their Captain Kidd's Kölsch unlocked Respect the Kölsch (Level 2). I quite enjoyed the beer, although it was slightly sweet for the style. I can definitely see it working in a hot tropical climate! Wednesday passed without a badge, as our planned rest day in the middle of Good Beer Week went off without a hitch. Thursday was always going to be a big night and I kicked it off with a Lagunitas IPA at The Great Northern. These guys have a relationship with Lagunitas and, I believe, are the only place that legitimately imports and sells their beers in the Southern Hemisphere. This one was a fresh tasting, clean IPA - but nothing to write home about. Here Come the Vikings (Level 8) was one of a staggering 7 badges unlocked at the Pig vs Viking Beer event at Atticus Finch. Nøgne Ø's Imperial Brown Ale was the beer and it was quite impressive. The first sip was initially quite sweet, but as it warmed it developed into a wonderfully rich, malty beast of a beer. Various caramel notes were the dominant flavour, whilst there was also some dark fruit flavours which became more prominent as the beer warmed. Another Imperial dark Scandinavian beer at Atticus Finch unlocked 2X (Level 22). Amager's Brown Boobies Falling is an Imperial Coconut Porter brewed in collaboration with Lervig. I found the coconut to be completely overpowering, with only the faintest hints of sweet malts coming through. Others at our table thought the coconut was very subtle, so whether this is bottle variation or perception is open to interpretation. Sky's the Limit (Level 30)! The beer is unique, to say the least! Ostensibly a smoked barleywine; it's heavily smokey on the nose, although this (thankfully) doesn't translate fully to the taste, with nice hints making their way through the wonderfully sweet malts. It's a big, rich beer which hides its 11% ABV very well. It's brewed on the shortest day of the year every year in Norway and is a beer best suited for sipping during the cold winter months. After nursing a monumental hangover through work all day Friday, I somehow pulled it together for Mega Dega 5 that evening. The first welcome beer (yes, there were multiple!) unlocked the American Craft Beer Week badge - which this year happened to coincide with Good Beer Week. The beer was Citrus Myrtle from The Commons Brewery, a Saison with reasonably tart citrus complimenting the typical yeasty characteristics. The interesting outlier in all the beers served to us that nice was the Goose Island IPA, which unlocked it's own "Road to the Harvest - Cascade" badge. The Goose Island IPA has been recently launched by CUB in Australia and will be contract brewed in Australia very soon. The beer was tasting very fresh, had a nice earthy, caramel base and some fruity and floral hop characteristics. I really hope the CUB deal gets this into sporting venues in the not too distant future! Almost a month on; I think I've just about fully recovered from what was a sensational week of beer, food and friends. I haven't been to a heap of other beer festivals around the world, but I've heard Good Beer Week is right up there. For those of you thinking of making the trip to the greatest city on earth next year/those of you who need to take time off in advance; May 11 through May 20, 2018!